Lamay Lodge and Huacahuasi Lodge are owned and run by Mountain Lodges of Peru who operate the Lares Cultural Trek. Built of local materials, using traditional Inca building techniques, each has 8 rooms, with plans to expand this to 12, and has been designed and built to fit into the environment. They are similar in terms of facilities and share certain design features, such as hand-woven rugs, too. They provide comfortable accommodation, nourishing food and attentive service, all very welcome after a day spent trekking in the mountains. You're greeted with a welcoming drink and a warm towel on arrival, and you'll find a comforting hot water bottle and herbal pillow in your bed - bliss! Each lodge has a lounge complete with a roaring open fire, a bar and dining room where nutritious, freshly prepared meals made with locally-sourced ingredients are eaten communally. Picture windows serve dual functions, ensuring rooms are light and letting you enjoy the mountain panoramas. There is either an outdoor terrace or barbecue area at each lodge for al fresco refreshments. Massage services are offered and each lodge has an outdoor Jacuzzi, for that special indulgent, and well-earned, treat. NB A third lodge is scheduled to open at Patacancha, and will also be used in the Lares Cultural Trek. Open: The lodges are open from March 1st to December 31st. 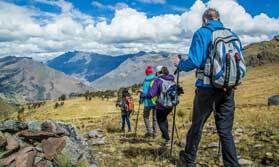 Location: The lodges are located at strategic and scenic locations along the Lares Trail. Rooms: Each lodge has eight rooms. There are plans to increase this to 12 rooms. Bedrooms are spacious and light, and the en-suite bathrooms have hot and cold running water plus a selection of toiletries. Ther's a handy drying line in each bathroom, too. A limited number of hairdryers are available. Dining: Meals are eaten communally in the dining room. Children: As the trekking can be fairly demanding, the lodges are not recommended for children under the age of 12. Health: The Sacred Valley is not a malarial area. Communication: There is free Wi-Fi internet access, and the lodges also have satellite telephones. Trek across mountain passes, see life in rural villages, stay in lovely lodges and experience the thrill of that first sight of Machu Picchu.